Prematurely aging skin gets radiant moisture with this light, quickly absorbed day and night all natural face cream. Weleda Wild Rose Smoothing Facial Lotion helps your skin’s natural growth process to soften fine lines and maintain its youth and vitality. Weleda Wild Rose Smoothing Facial Lotion is an all natural skincare packed with youth-extending antioxidants. Organic rosehip seed oil provides an exceptionally high amount of essential fatty acids and antioxidants that preserve your skin’s elasticity and vitality to counter the first signs of aging. Organic jojoba seed oil acts as an emollient to smooth and soften your skin. 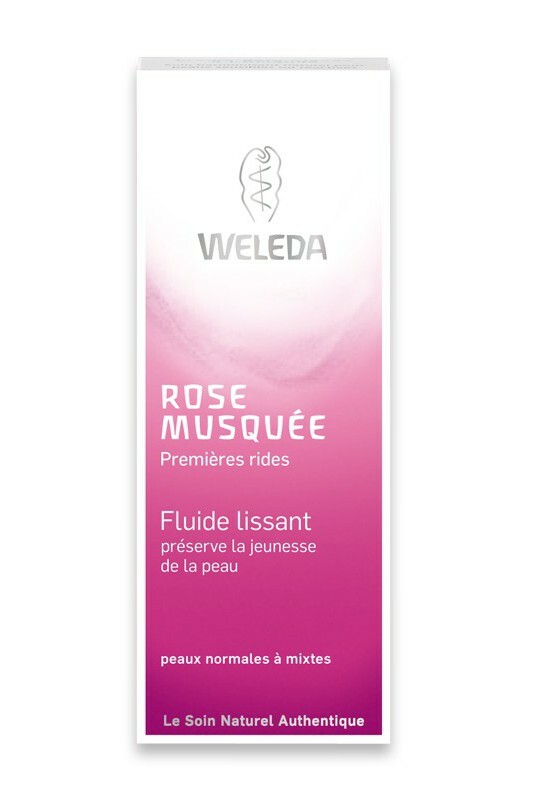 Your skin feels nourished, rejuvenated and palpably softer after using Weleda Wild Rose Smoothing Facial Lotion. The delicate, lingering fragrance of fresh organic roses harmonizes your senses and promotes healthy balance for you and your skin. J'adore ce produit. Je l'utilise depuis 6 mois : odeur agréable, texture légère, pénétration rapide. 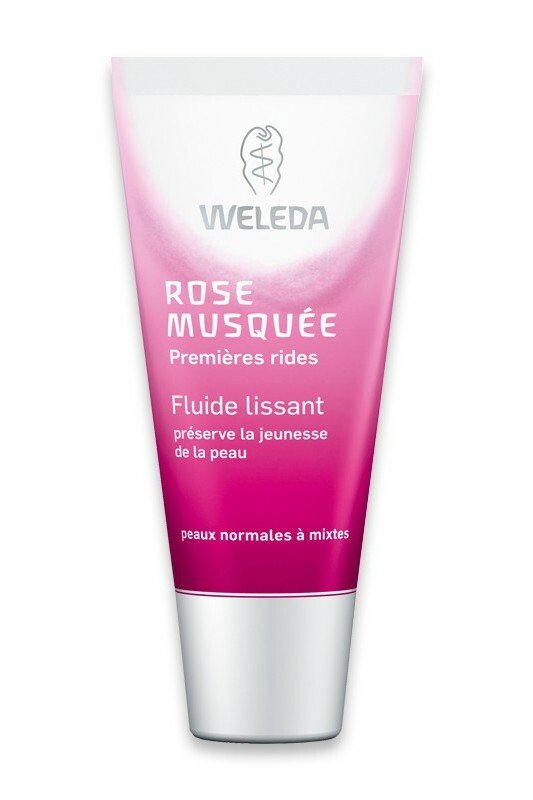 Apply Weleda Wild Rose Smoothing Facial Lotion to face, neck and décolleté after cleansing and toning. Massage in gently. Use only as much as the skin can fully absorb. For dry skin Wild Rose Smoothing Facial Lotion can be used in combination with the more deeply protective Wild Rose Smoothing Day Cream, or it can be mixed with the more deeply protective Wild Rose Smoothing Night Cream to produce a richer cream. Highly suitable for use under makeup. Water (Aqua), Alcohol, Simmondsia Chinensis (Jojoba) Seed Oil, Prunus Persica (Peach) Kernel Oil, Glycerin, Rosa Moschata (Rosehip) Seed Oil, Glyceryl Oleate, Copernicia Cerifera (Carnauba) Wax, Beeswax (Cera Flava), Magnesium Aluminum Silicate, Fragrance (Parfum)*, Sedum Purpureum (Orpine) Extract, Rosa Damascena (Rose) Flower Wax, Equisetum Arvense (Horsetail) Extract, Commiphora Myrrha (Myrrh) Extract, Xanthan Gum, Chondrus Crispus (Carrageenan), Glyceryl Stearate SE, Sodium Beeswax, Limonene*, Linalool*, Citronellol*, Benzyl Alcohol*, Geraniol*, Citral*, Eugenol*, Farnesol*. L'odeur de rose est extrêmement puissante! Impossible de l'utiliser le soir tellement l'odeur est forte. En application le matin ce produit ne constitue pas sur moi une bonne base de maquillage ...je ne renouvellerai pas cet achat.